aww, look at the cute little 6.5" stock wheels! These coilovers were the first appreciable modification to the car. The stock suspension was pretty worn out at 77k miles due in large part to Louisiana’s awful roads (Colorado’s are so much better!). So what to replace the stock suspension with? I caught wind of these Miata-tailored Ohlins coilovers on sale and I bit the bullet. Single-adjustable, 1-25 clicks. I’d imagine the 20-range would be suitable for very smooth, flat tracks like Circuit of the Americas. I daily drive & canyon carve around 10-15. Dropping down near 1 smooths things out pretty close to if not better than the stock ride. These monotubes are Swedish marvels. They have versatility, great communication, and an outright restraining order level of attraction to the tarmac. 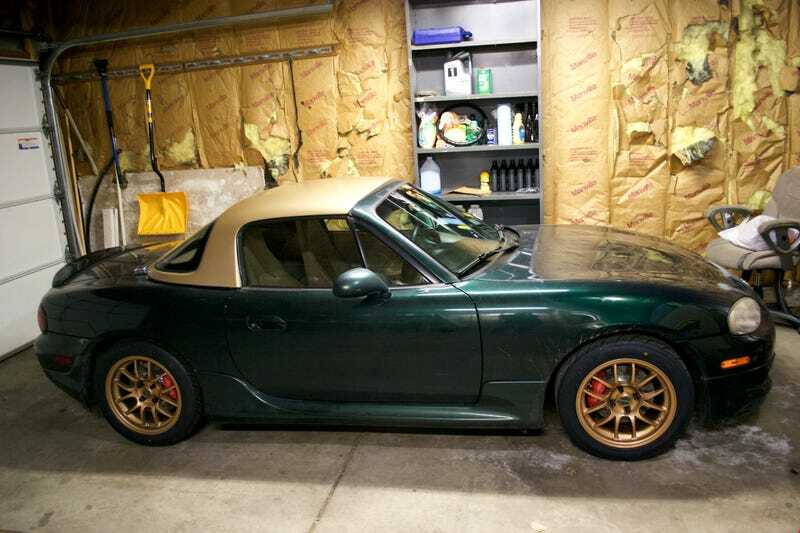 Well worth the money if you value your Miata’s suspension. And did I mention they’re shiny and gold? Over the past few months of use my brake pads had been nearing the end of their dutiful lives. When those pads entered service, I had the rotors turned to saved some cash, so this time around I would be replacing them, too. If I’m replacing pads & rotors...why not take things a step further? I’d had my eye on Flyin’ Miata’s Little Big Brake Kit some time. The stock floating calipers are replaced with Wilwood Powerlite 4-piston aluminum calipers on all four corners, shedding an awful lot of unsprung mass in the process. What’s notable about this kit is that the rear calipers are modified to accept a handbrake. It’s a pretty weak handbrake, though. I think it may need some adjustments to get the most out of it. Since the rotors needed to be replaced and I was using new calipers, I had the opportunity to upgrade my Miata’s base 10" rotors with the sport 11" rotors. Vented and drilled, too? Sure, why not. Bigger rotors, 4x the pistons, and a good deal of excess unsprung mass excised? Yep, count me in. So...about those big brakes up there. They actually didn’t quite fit the 15x7.5 black 949racing 6UL wheels I had at the time. The fronts cleared, but just barely. They would need a spacer. And the rears? That special handbrake cable was in the way. And so the answer to this dilemma, like so many others in life, was to buy new wheels. New gen4 15x8 ‘bronze’ 6UL wheels, to be exact. That extra half-inch and the resulting change in offset made all the difference in the world! Guess what! The BFGoodrich Rivals that were on my old black wheels were also getting long in the tooth. So new wheels meant new tires. The R-S3 had comparable reviews to the new Rival S on Tire Rack and had a $100 lower price tag Rival S, so here we are with 225/45-15 tires (compared to the stock 205/45-16). I haven’t put even put 100 miles on them, so I can’t do much in the way of comparisons yet. The Miata is sitting in my garage with 91,019 miles (146k km) on her right now. I put most of those miles on the car myself, with plenty of quick shifting throughout. The shifter needs a rebuild. I think you can see where this is going. MiataRoadster sells a rebuild kit that also includes an extended short shifter. The idea is to extend the shifter to bring it 4" (10 cm) closer to the steering wheel while keeping the same relative length throw with the short throw shifter. I’m very excited to install this over the weekend. My shifter has been practically begging for new parts for so long now! So in the course of upgrading worn-out components I’ve managed to trim 34.6 lbs of unsprung mass off the car. Combined with my 60-lbs weight loss, my Miata and I are damn near 100 lbs lighter than we were four years ago. How’s that for a gram strategy? More photos to come soon once Denver’s weather decides to get all warm & sunshiny again next week.